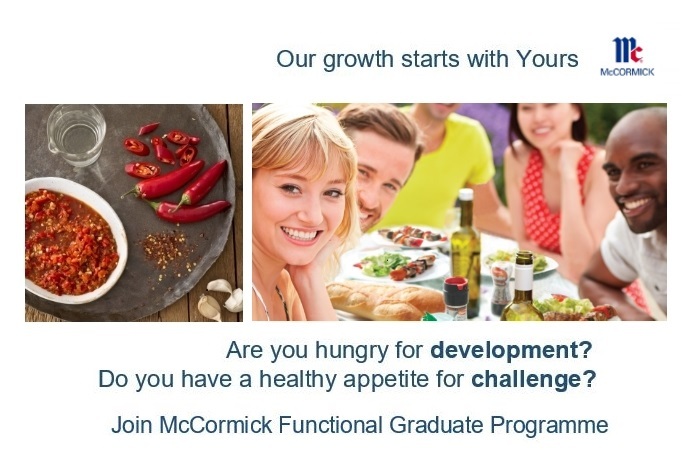 Participating in the McCormick Functional Graduate Programme provides the opportunity to build your career with a global leader in the food industry. You will participate in challenging projects, grow your experience and capability across functions and enjoy our culture based on our belief of the 'Power of People'. We offer an employment based on fixed term contract for 12 months. McCormick is a global leader in flavour. With 11,700 employees around the world and $4.8 billion in annual sales, we manufacture, market and distribute spices, seasoning mixes, condiments and other flavourful products to the entire food industry, retail outlets, food manufactures and food service businesses. We have a passion for flavour. The company has facilities in more than 50 locations in 27 countries and consumers purchase our brands in more than 150 markets and territories. In the Poland McCormick leading brands is KAMIS.